Larry Jacobson spent his career with the University of Minnesota’s ag engineering department working to improve the Minnesota and U.S. livestock industries by implementing new building designs to create a better environment both inside and outside of the barns. U.S. hog producers should be glad Larry Jacobson did not pursue his intended electrical engineering degree when he was an undergraduate at the University of Minnesota in the early 1970s. Not that he couldn’t have made great contributions in that field, but his work as an agricultural engineer changed the way people think about odor and outdoor air quality. Until two years ago, Jacobson was an Extension livestock housing specialist in the University of Minnesota’s Department of Bioproducts and Biosystems Engineering. Though he worked with all animal species, he says the majority of his time was spent with pork producers. “In the ’70s when I started, the poultry industry had already consolidated, and I was just at the cusp of the swine industry consolidating,” he says. He remembers visiting the Marlin Pankratz farm near Mountain Lake, Minn., the biggest at the time with 400 sows. “By the mid-’80s, hogs had consolidated, first with the co-op sow units. I remember visiting with Bob Christensen when he was still in high school; he was expanding with remodeled facilities … there was a lot of interest in facilities,” he says. Because of the expansion taking place then, “there was a great appetite for housing,” he says. As a result of the expansion and consolidation, “we ended up with this issue around air quality and odor with a lot of animals housed in one site, and it became pretty heated, pretty controversial,” Jacobson says. The Minnesota countryside was setting up as a battleground of sorts, as county and township boards were seeking expertise into the matter while they attempted to referee battles between hog producers and their neighbors. Though there was local control of these feedlot issues, Jacobson says the Minnesota Department of Agriculture, recognizing the magnitude of the issue, stepped up and asked what it could do. Jacobson knew it would take time, but he believed his department could build a model to find out just how much odor was being emitted by livestock facilities. The model Jacobson’s team created would become known as the OFFSET (Odor From Feedlot Setback Estimation Tool) model; it remains in use today, helping producers calm battles between themselves and the public. Though OFFSET was developed to aid the Minnesota livestock industry, including swine, it has been used in other states. It is for this widespread impact that Larry Jacobson is being honored as one of this year’s Masters of the Pork Industry. OFFSET is designed to estimate average odor impacts from a variety of animal facilities and associated manure storages. Jacobson says the development of OFFSET was a three- to four-year process because there was “no data available of just how much odor is coming off these places.” Jacobson’s team was able to borrow tools from other industries to see how odor disperses from sites. Instead, Jacobson’s team could spend their time developing a proper protocol to collect samples from sites to build a “pretty strong database and plug in the model, and we had it. It was used right away,” he says. Larry Jacobson demonstrates the use of an olfactometer in the lab at the University of Minnesota Department of Bioproducts and Biosystems Engineering. The olfactometer is used to measure the odor concentration of samples brought into the lab from various livestock farms. As Jacobson’s team developed the OFFSET model and incorporated the olfactometer results in their lab, they also relied on the God-given technology of the human nose. 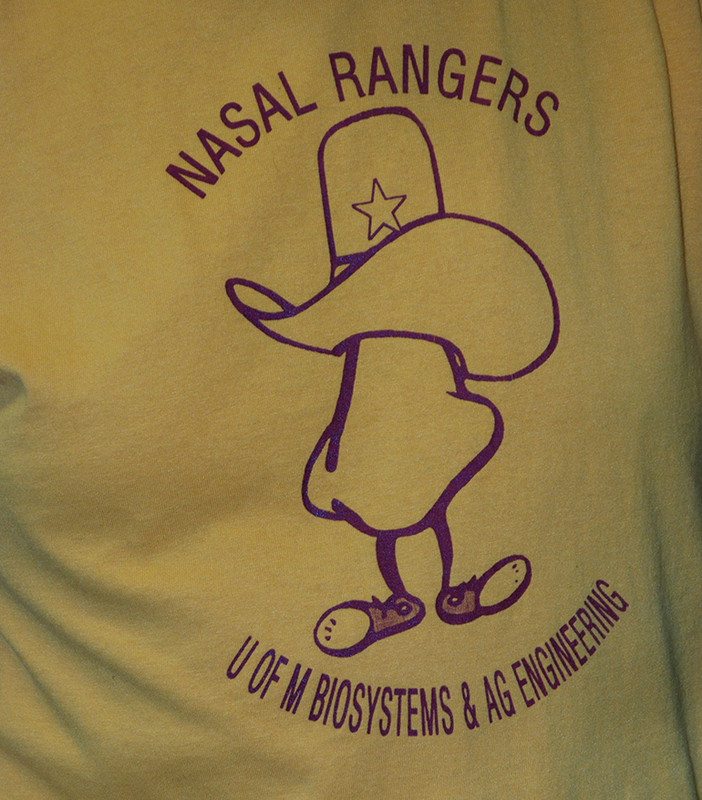 Jacobson’s team assembled a panel of people with a discriminating sense of smell called the Nasal Rangers. They were taken to farm sites to measure odors released from livestock buildings and associated manure storages. “Since we knew what the source odor emissions were, and the weather data from our portable weather station, we could plug this data into OFFSET and generate an estimated odor concentration at various downwind distances that we could verify with Nasal Ranger numbers. This was how we developed confidence in and validated the model,” Jacobson says. The Nasal Rangers made trips to 20 to 30 farms that housed hogs, dairy and poultry to get downwind odor data that were then compared to OFFSET model results, building more confidence in Jacobson’s team’s methods. Not just anyone could cut it as a Nasal Ranger; Jacobson’s team evaluated each person who stepped up to join the panel. People’s ability to smell varies; some are hypersensitive, while others have a poor sense of smell. Fortunately, a majority of people are in the middle, and screening methods identified those people. Nasal Rangers went through one-day training, and Jacobson believes the panel was a cross-section of citizens. They got a relatively small stipend for their services. Jacobson’s team employed a panel of people who visited farms to measure the level of odor leaving livestock barns. 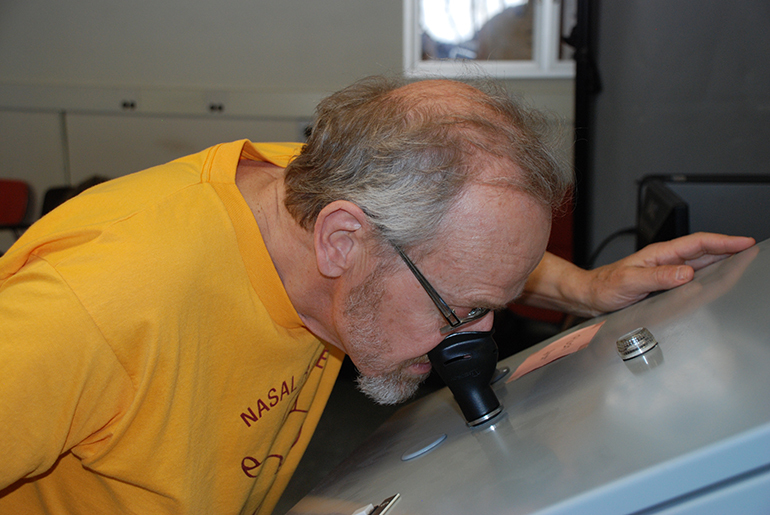 The Nasal Rangers also spent time in the lab using the University of Minnesota’s olfactometer. T-shirts were made to develop team camaraderie. The same procedures used to select Nasal Rangers were used for selecting panelists in the more controlled atmosphere of the olfactometer lab back on the St. Paul campus of the University of Minnesota, to measure the odor concentration of samples brought into the lab from various livestock farms. St. Croix Sensory has actually trademarked “Nasal Ranger” as the name of the company’s portable olfactometer that can be used in the field. OFFSET’s development has opened doors for Jacobson to do out-of-state consulting work, as well as to testify in odor nuisance cases as a friend of the court, though he does not seek out that work. “I see the need for that, and that is part of why we developed OFFSET — to get a settlement, work out some options to try to avoid litigation. That was the goal from the get-go with the Department of Ag, and we agreed with that. … Every case is different, and there are two sides to every story, and some are a combination of the two,” he says. Though Jacobson never held a teaching assignment at the University of Minnesota, he spent plenty of time in front of “classes” during daylong workshops around hog country in Minnesota for county feedlot officers and other key policymakers to learn how to use OFFSET. “We kind of became the go-to for this,” he says. It wasn’t long before that expertise was sought beyond the borders of the Gopher State. Michigan, South Dakota and Nebraska were the first states to reach out to Jacobson’s team. He says Iowa had already developed a similar model. OFFSET only tells producers and others the amount of odor that comes from specific livestock operations, but then it is up to the producer to find the best odor mitigation practice. Jacobson would like to see more odor control technologies available for hog producers, but he says so far they can only reduce a “small percentage” of the odor. “Odor is interesting in that unless you have a technology that knocks it down by at least 50%, it’s hard to notice the impact, because our sensation is logarithmic, meaning you need to have a bigger impact to notice a reduction,” he explains. Just as Jacobson sees a need for improved technology for odor abatement, he also sees the need to improve the OFFSET model. “We would not have to start from scratch, but we need to update our database because we have new facilities and new designs, and there’s been an improvement in dispersion modeling. And the collected weather data are a lot better than they were 20 years ago,” he says. 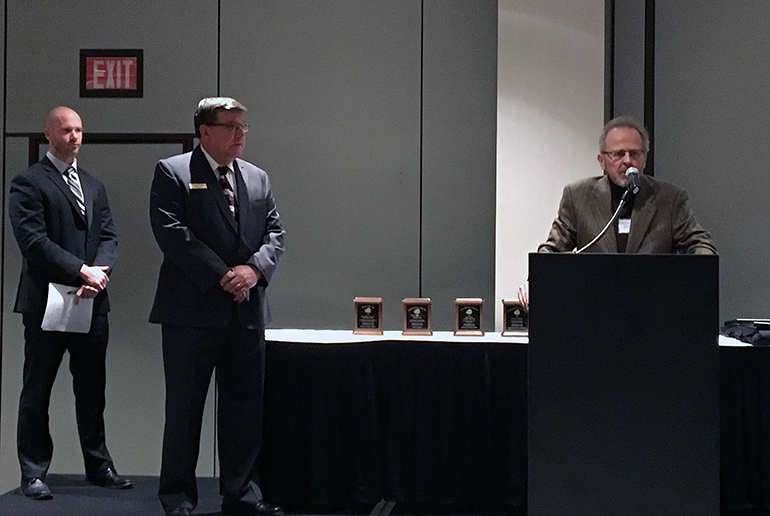 Larry Jacobson, retired University of Minnesota professor in the Department of Bioproducts and Biosystems Engineering, receives the Environmental Steward award during the awards reception that kicked off the 2018 Minnesota Pork Congress in downtown Minneapolis. Farm broadcaster and emcee Mark Dorenkamp (left) and 2017 Minnesota Pork Board President Reuben Bode of Courtland, Minn., look on. This award was sponsored by Balzer Inc.
Jacobson’s dairy farm background served him well as he became a specialist in livestock facilities, ventilation, odor and dust control, but that career almost wasn’t. After graduating from high school in Pelican Rapids, Minn., in 1968, he attended the University of Minnesota-Morris. After two years of pre-engineering classes, he transferred to the main campus in the Twin Cities. He had planned on majoring in electrical engineering, but his interest in ag engineering had been piqued by being exposed to the livestock facilities at the University of Minnesota West Central Experiment Station at Morris. When he was hired, there was the stipulation that he would complete his doctorate, “but with the Extension position, I was getting out and talking to the producers. I was really trying to connect with them one on one.” As a result of being on the road as much as he was, he didn’t complete his doctorate until 1983. After growing up on his family’s 30-cow dairy farm in Minnesota’s lake country, though he enjoyed working on the farm, Jacobson knew he didn’t want to be a farmer. The first in his family to go to college, he had an aptitude for math and sciences, so it seemed obvious to become an engineer. Early in his career he enjoyed making farm visits, and he was fortunate to travel and make presentations at swine meetings with fellow University of Minnesota stalwarts Al Leman (swine health), Chuck Christians (swine genetics) and Jerry Hawton (swine nutrition). “Traveling with all of them was a real learning experience for me — a lot of exchange of good information,” Jacobson says. Making individual farm visits would be frowned upon by today’s biosecurity measures, “as I think my record was visiting 13 farms in one day,” he adds. He took a one-year sabbatical in 1994-95 to Denmark, to work with researchers focusing on environmental, indoor air quality in hog facilities. “That was good timing, because when I came back here, the issues with livestock odors were really heating up in Minnesota,” he recalls. Jacobson did not go to Denmark alone. His wife, Jane, and their two sons, Karl and Kurt, became immersed in the Danish culture. Kurt, who was 10 at the time, picked up the Danish language and much later did postdoctoral work in Switzerland after receiving an environmental engineering degree at the University of Wisconsin. He now lives in Madison, Wis. Karl, who was 13 when they were in Denmark, got his biology degree from the University of Minnesota and now works for the Red Cross in the Twin Cities. Jacobson and his wife do some traveling in their retirement, but they have three Labrador retrievers, which makes it a little difficult to get away. He hopes to get out in the Minnesota fresh air with the dogs to hunt pheasants and grouse. As the dogs are trying to catch the scent of the birds they’re tracking, Jacobson can breathe deeply of air he spent a career understanding and improving.